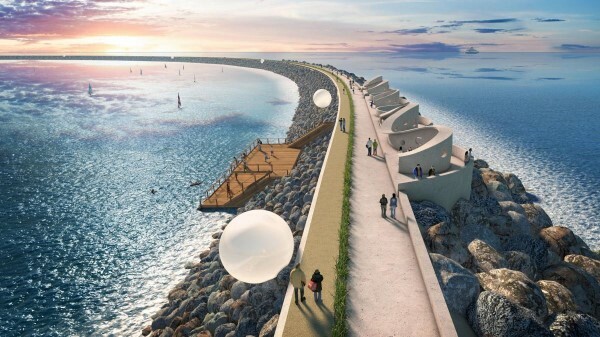 We've been on the case of the ridiculous Swansea Tidal Lagoon since it got a mention in the Tory 2015 manifesto. Since then, the only noteworthy developments have been (a) a really laughable 'official independent report' on tidal lagoons in 2017 by Charles Hendry, a classic old-school red-faced Tory buffer who was seriously suckered by the Swansea mob's slick PR (it's all they've got) into supporting the notion; and (b) the Welsh government being equally suckered into offering under-priced finance to get the thing off the ground. The FT is now reporting that the lagoon will be given the long-overdue coup de grâce this coming week. Praise be! There was always the chance the Tories would be so desperate for Welsh votes, they'd just roll over and pay up the monstrously expensive subsidy being sought. If the FT is right, we shall raise a glass to those in charge at BEIS. I cannot believe that this took a full scale expriment to prove wrong. Surely it could have been done on a computer simulation. Surely it could have been done on a computer simulation. For everyone they kill, one or more slip through. Look at the farce in the Cash for Ash scandal in NI. And look at the political result when you have a government so desperate for votes, they pass on even more cash. No need for a simulation here to see the outcome. private eye had another good review of it as well last week. The most interesting bit was that the stones were to come from a quarry conveniently owned by the boss M Shorrock himself! Plus of course the cracking deal Ms J Davenport (Mrs Shorrock) was able to get comprehensive charge on the lagoons assets. FFS. I shouldn't come on here drunk. A computer simulation of ambitious businessmen, their wives and their political contacts would tell you what you need to know about most of the "renewable energy" industry. It is a system for extracting money from the taxpayers and electricity consumers. You'd feel at home,esp when in a "certain condition"
Let's be grateful for small mercies - but it's sad that we're all celebrating a government NOT doing something stupid - I guess that means stupid is the modern default.